Hotdish Home Buyers, a residential real estate investment company in St. Paul, needed a website that showcased the unique value-add they provide to motivated home sellers: Not only do they buy distressed homes for fast cash, but they also provide Realtor services and licensed home inspection services. They needed a site that would generate leads, and they needed it fast. Website. 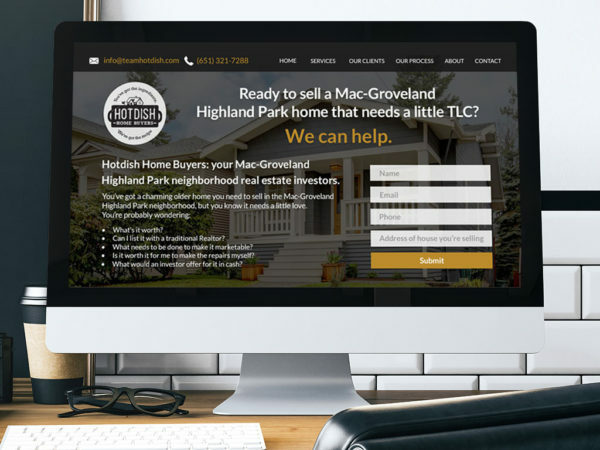 Hotdish Home Buyers was anxious to get a landing page up immediately, so within a few days, we built them a simple landing page with a contact form. Then we got to work designing a site that used authentic, original photos and video of the neighborhood they work in. Consulting. Hotdish Home Buyers came to us thinking the website should focus only buying distressed homes for fast cash. But after talking with them, we helped them see that having a licensed Realtor and home inspector on the team was a unique value proposition they should also emphasize. Content. Once we nailed down Hotdish Home Buyers’ three-pronged approach–cash for distressed homes, Realtor services and home inspection services–we created search engine optimized content for the site. Video. We knew having visuals on the site that showed the specific types of 1920’s to 1940’s craftsman homes they work on was important. So we went out into the neighborhood with our video equipment and recorded original footage to be used as a video header on the site. Having that engaging movement on the site sets it apart from the templated websites common among real estate investors. Call us today to learn how we can create a lead-generation website for you. 651.357.4174.